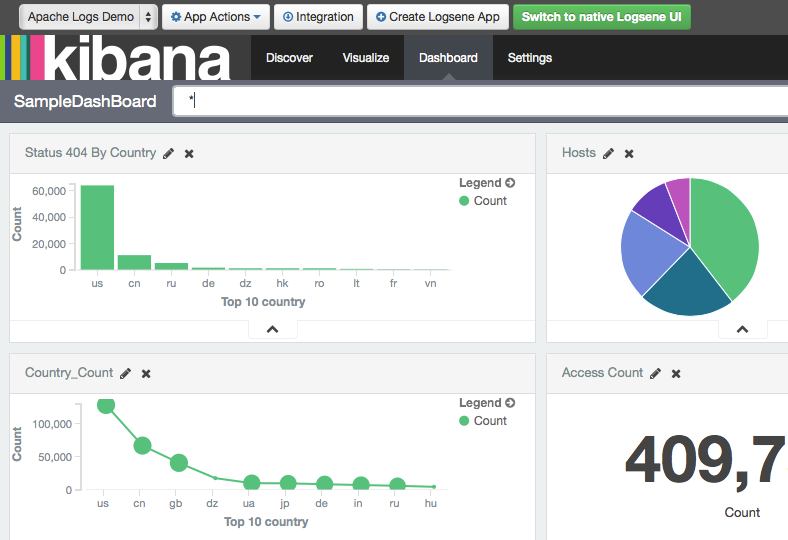 More than two years ago we posted a recipe on how to centralize syslog in Elasticsearch in order to search and analyze them with Kibana, all by using only rsyslog. This works well, because rsyslog is fast and light, as we shown in later posts and recent presentations. We’ll also cover pushing system logs and how to buffer them properly, so it’s an updated, more complete recipe compared to the old one. NOTE: If you’re used to Logstash’s grok, this kind of parsing rules will look very familiar. However, things are quite different under the hood. Grok is a nice abstraction over regular expressions, while liblognorm builds parse trees out of specialized parsers. This makes liblognorm much faster, especially as you add more rules. In fact, it scales so well, that for all practical purposes, performance depends on the length of the log lines and not on the number of rules. This post explains the theory behind this assuption, and there are already some preliminary tests to prove it as well (some of which we’ll present at Lucene Revolution). The downside is that you’ll lose some of the flexibility offered by regular expressions. You can still use regular expressions with liblognorm (you’d need to set allow_regex to on when loading mmnormalize) but then you’d lose a lot of the benefits that come with the parse tree approach. And that’s it! Now you can restart rsyslog and get both your system and Apache logs parsed, buffered and indexed into Logsene. If you rolled your own Elasticsearch cluster, there’s one more step on the rsyslog side. Logsene uses time-based indices out of the box, but in a local setup you’ll need to do this yourself. Such a design will give your cluster a lot more capacity due to the way Elasticsearch merges data in the background (we covered this in detail in our presentations at GeeCON and Berlin Buzzwords). And now you’re really done, at least as far as rsyslog is concerned. For tuning Elasticsearch, have a look at our GeeCON and Berlin Buzzwords presentations. If you have additional questions, please let us know in the comments. And if you find this topic exciting, we’re happy to let you know that we’re hiring worldwide. hi Radu, thanks for this amazing article, I have learnt a lot from it. I am facing a problem and can’t solve it myself, can you help me? but unfortunately they are different, is there a way to sync them? Thanks for your nice words, I’m glad you found this useful. I tried to send this format to Elasticsearch directly but it didn’t work. So is there any way I can converge this format to rfc3339 in Rsyslog and then send it to Elasticsearch? You should get an ISO timestamp like yyyy-MM-ddTHH:mm:ss.SSSZ that Elasticsearch will parse out of the box. This assumes your timestamps are UTC (that’s that the “Z” says). Otherwise if you’re UTC+1, for example, you’d add “+01:00” instead of “Z”). The issue is little better now as all INFO messages does not go to /var/log/messages like before, but still goes to elasticsearch. Sure, here is the other rsyslog conf file that sends system logs to elasticsearch. I think that omelasticsearch action sending your system logs may send everything, depending on where elasticsearch.conf is located (or rather, where the IncludeConfig directive is located in rsyslog.conf). For “stop” to apply, IncludeConfig needs to be after “stop”, otherwise it would send logs to Elasticsearch before it stops processing them. it was a combination of what you mentioned and a proper template definition for HDFS logs. Thank you very much for your help and the great posts. They are really helpful and helps considering both rsyslog and logstash approaches. I’m very glad to hear you solved your issue. Also thanks for your nice words! I collect with rsyslog system logs and ship them to elasticsearch nodes. Besides that, I like to parse and send hdfs logs too, but ONLY specific lines, the ones that contains WARN or ERROR. all the rest should NOT go to elastic. I created an mmnormalize rule, but all the other lines like INFO also get sent to elasticsearch. Here is my configuration hoping you can help me. How can I ignore lines that does NOT match my rule/parsing rules? If I understand correctly, that $parsesuccess variable doesn’t return what it should, it’s OK everytime? As a workaround, you can change the conditional to ($!pri == “ERROR” or $!pri == “WARN”). Pingback: Logagent-js – alternative to logstash, filebeat, fluentd, rsyslog?